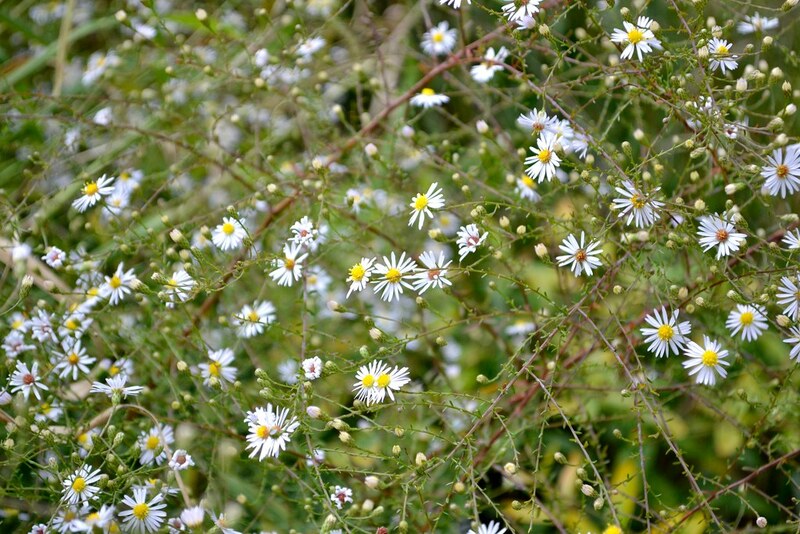 Fall brings sprays of starlike asters to Brooklyn Botanic Garden. As summer flowers dwindle, asters provide colorful blooms and food for pollinators, which can currently be observed swarming around the white, blue, and purple flowers in the Native Flora Garden. 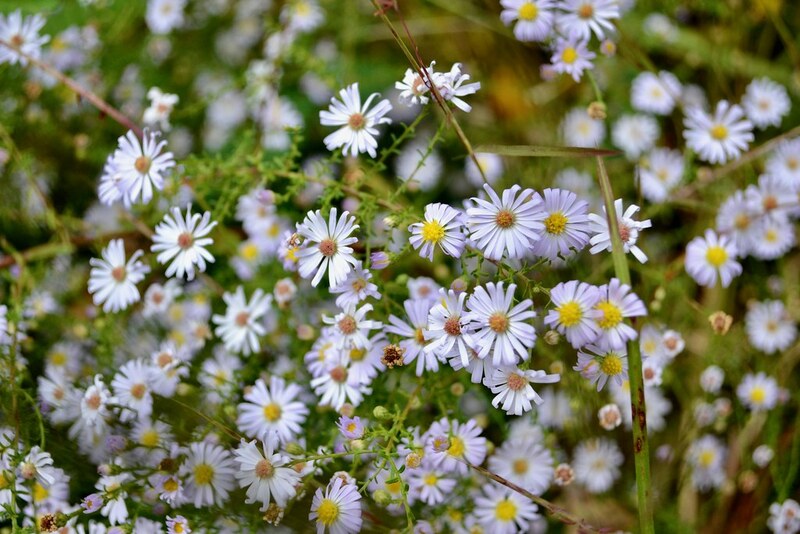 Sometimes considered weeds and sometimes grown as showy ornamentals, asters can grow from two to three inches to over six feet tall and take a number of forms, from clumping and compact to rangy; their most notable common characteristic is their composite flower heads. These are formed by clustered ray and disc florets that are often mistaken for single flowers. Most of the asters at Brooklyn Botanic Garden are no longer considered members the Aster genus, even though they still carry the common name “aster.” In the 1990s, morphological and molecular studies showed that North American asters were not closely related to Eurasian asters and did not all belong in the same group. This led to the reclassification of all North American asters, save one, into smaller genera in the family Asteraceae. Most of the North American species now fall into the new genus Symphyotrichum, though some can be found in several other genera. 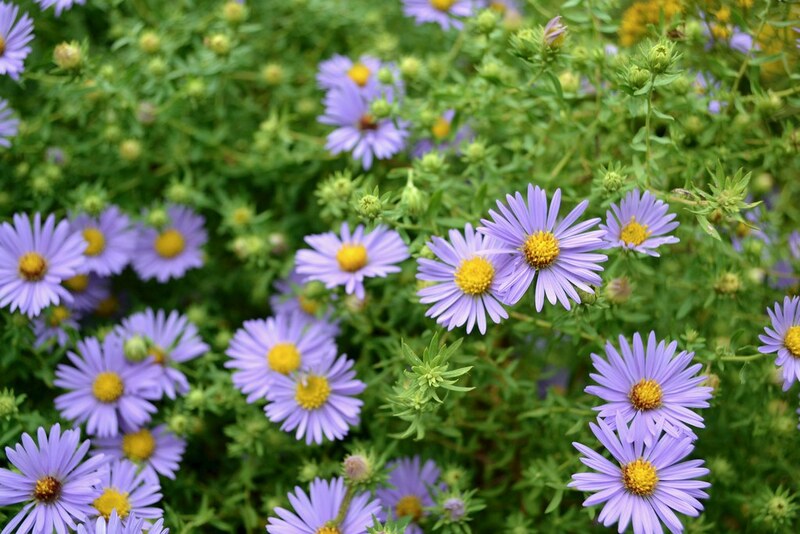 Aster used to be an enormous genus, containing about 600 species worldwide. Now it contains approximately 180 European and Asian species. Some species in BBG's Native Flora Garden were grown from seed collected in nearby natural areas by curator Uli Lorimer. Look closely and notice all the variation in flower color, leaf type, and growth habit within this large collection. Symphyotrichum novae-angliae (New England aster) is a popular garden plant. Its flower heads are darker and larger than those of other native asters. They also have more ray flowers. New England aster grows tall, up to five feet. 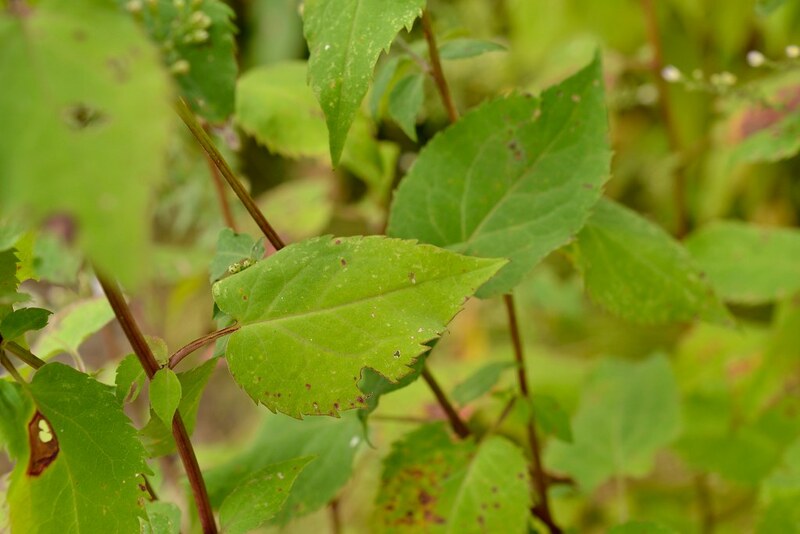 Its fuzzy leaves clasp around the hairy stem toward the base. 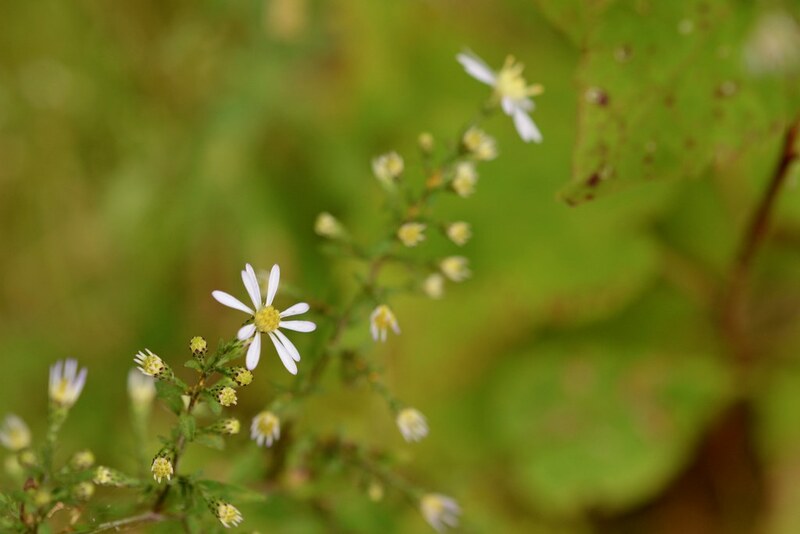 Symphyotrichum laeve (smooth aster) is glabrous, meaning that it has no hair on the stems or leaves. It can be distinguished from New England aster by its flowers, which are smaller and lighter in color. Symphyotrichum oblongifolium 'October Skies' (aromatic aster) is a mound-forming aster cultivar that is unlikely to spread and take over, making it a great option for gardeners, says Lorimer. It has fragrant foliage and blooms later in the season. 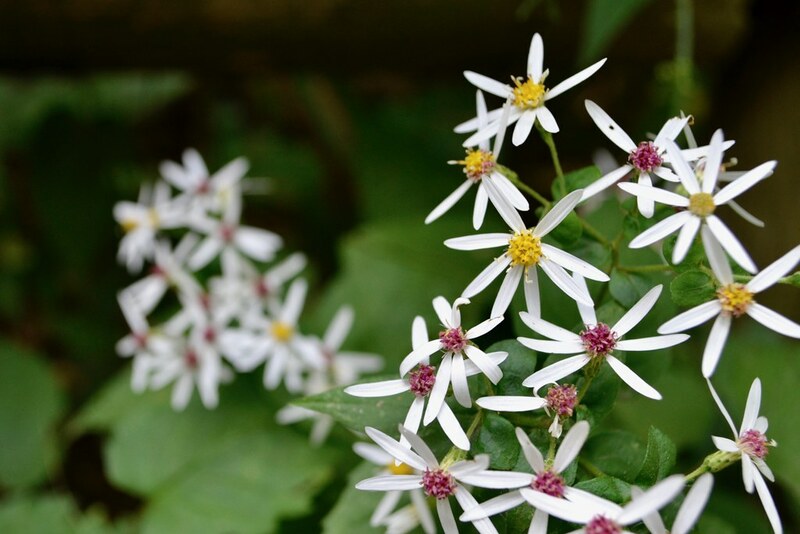 With it's spectacular, showy blooms, Eurybia spectabilis (eastern showy aster) lives up to both its common and botanical name. It's one of the shorter native asters, growing less than two feet tall. Ionactis linariifolius (flaxleaf whitetop aster) has light lavender flowers and foliage that looks like rosemary leaves. It is a short, drought-tolerant plant that can grow on ridgetops, unlike many of the other asters, which grow along the coastal plain. Symphyotrichum dumosum (long-stalked aster) has tiny leaves and very small flowers. The color of the flowers varies slightly in the Native Flora Garden; some are white, and some have a light lavender tint. The specimens here were grown from wild seed collected on Long Island, says Lorimer, which accounts for the variation in color from plant to plant. Eurybia divaricata (white wood aster) grows in the shade in the Native Flora Garden. In general, aster disc florets fade from yellow to red as they age. Bees visit the younger, yellow-centered blooms, which contain more pollen and have not yet been pollinated, but the older flowers still help draw them from afar. Symphyotrichum cordifolium (heart-leaved aster) is another great garden plant. Its low height and strong stems keep it from flopping over, and it tends to remain where it is planted. Fall is a good time to see members of the Asteraceae in general. 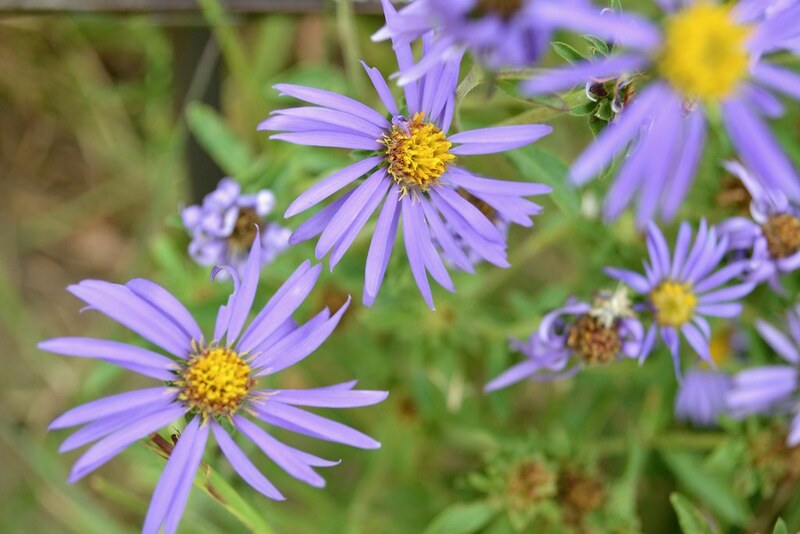 In addition to Symphyotrichum and Eurybia, many other aster relatives are coming out in full force, such as goldenrods, blazing stars, daisies, snakeroots, and sunflowers. Many of these plants can be found in the Native Flora Garden, as well as in a new section by Belle’s Brook in the Water Garden. 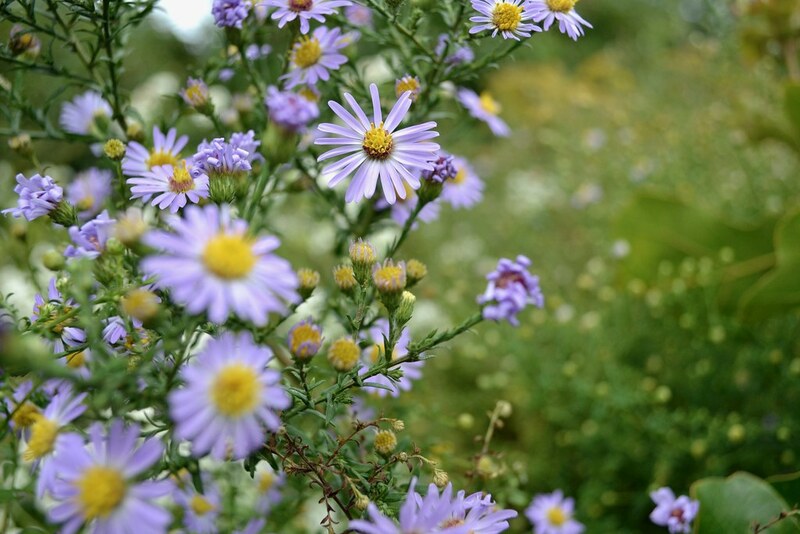 There are also beautiful stands of native asters in the Shakespeare Garden that have pink and purple blooms. 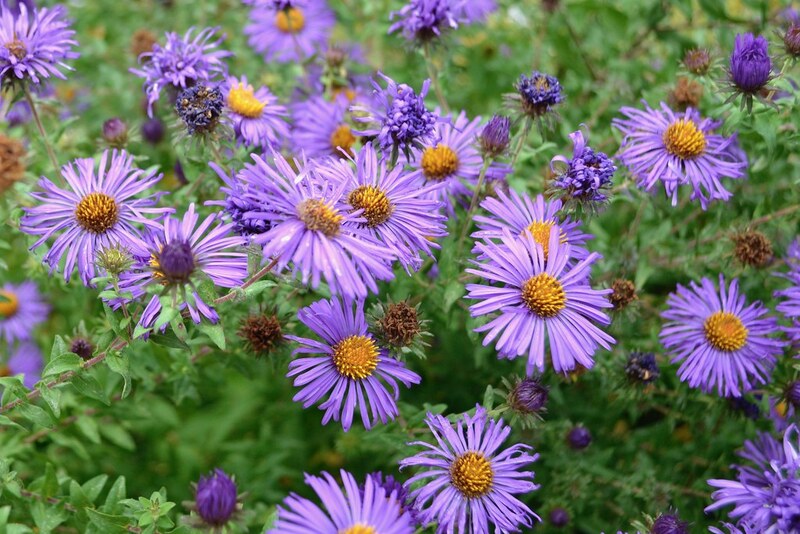 More: Grow asters in your own garden. Blanca Begert is Brooklyn Botanic Garden's photographer and digital media producer. I love Urybia divaricata (white wood aster)! It’s sweet how the older flowers magnetize bees from afar, and like shtetl matchmakers, direct them toward the younger, pollen-laden flowers. Symphyotrichum oblongifolium 'October Skies' (aromatic aster). Photo by Blanca Begert. Eurybia spectabilis (Eastern showy aster). Photo by Blanca Begert. Ionactis linariifolius (flaxleaf whitetop aster). Photo by Blanca Begert. Symphyotrichum dumosum (long-stalked aster) grown from seeds collected in the wild. Photo by Blanca Begert. 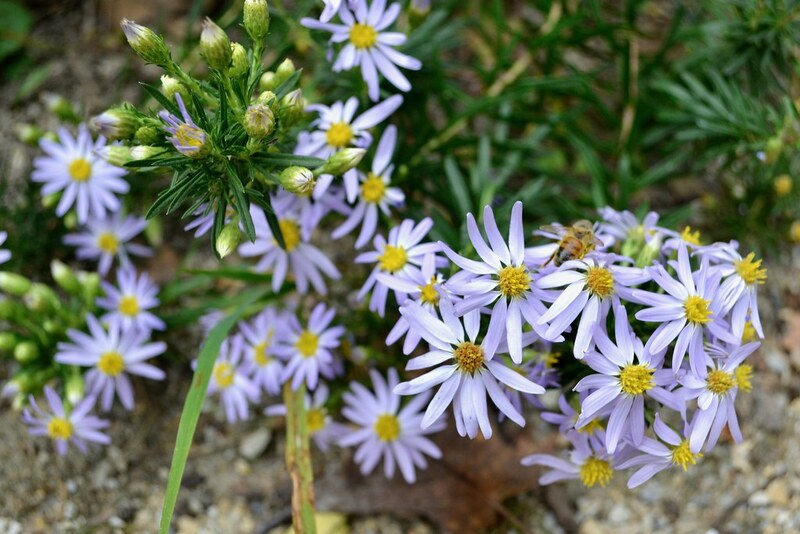 Symphyotrichum dumosum (long-stalked aster) displaying more pale purple color in its flowers. Photo by Blanca Begert. 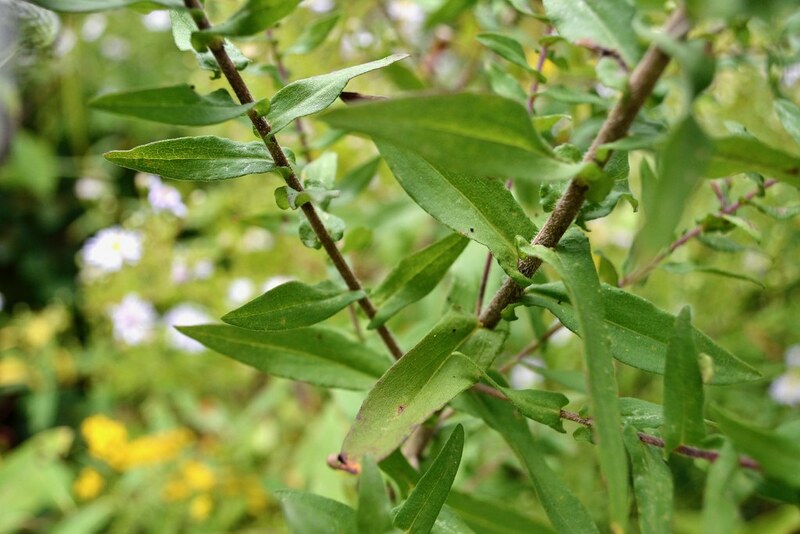 The heart-shaped leaves of Symphyotrichum cordifolium. Photo by Blanca Begert. Symphyotrichum cordifolium (heart-leaved aster) flower head. Photo by Blanca Begert. Symphyotrichum laeve (smooth aster) has no hair on the stems or leaves. Photo by Blanca Begert. The leaves of Symphyotrichum novae-angliae (New England aster) clasp around the hairy stem toward the base. Photo by Blanca Begert. 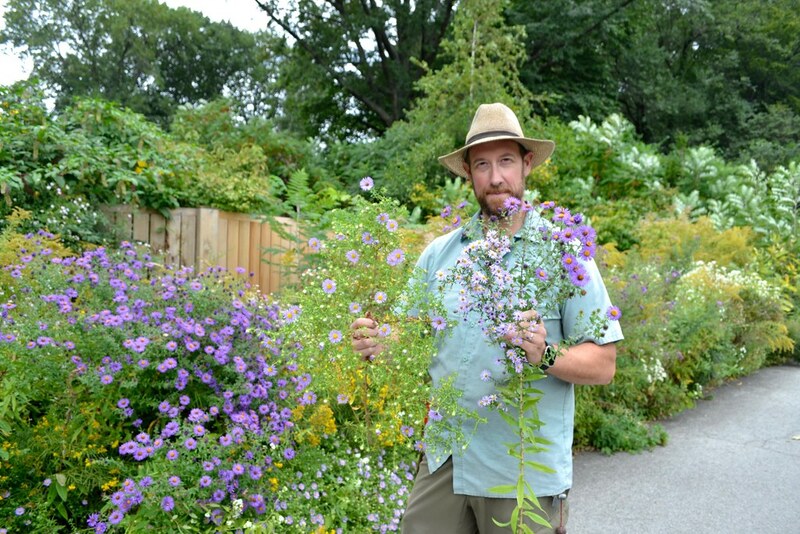 Native Flora Garden curator Uli Lorimer holds, from left to right, aromatic aster, smooth aster, and New England aster. Photo by Blanca Begert.